These groups meet on Wednesday mornings and are for those caring for pre-school children. It’s a place where you and your children can have fun, feel safe and make new friendships. 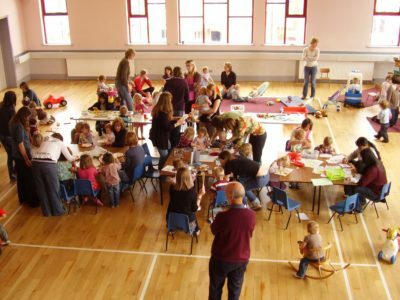 Whilst Jolly Tots is not exclusively for active Christian families, it is run by Church Members and other volunteers within a Christian environment. Many of the families stay on for our Wednesday Open House snacks and lunch. These involve singing, dancing, movement and signing with the aim of encouraging confidence and language skills as well as enjoying activity and movement. The sessions take place on Wednesdays, running alongside Jolly Tots. A full range of educational toys and games are available for members to borrow (for a small fee). The Toy Library runs concurrently with Jolly Tots on Wednesday mornings and the Baby Clinic on Monday Afternoons. Our rooms are open to all-comers every Wednesday morning between 9:30 and Noon. Open House is held in the centrum and is for anyone who fancies a cup of tea or coffee and a piece of cake whilst having a chat in good company. Snack lunches are served from 11:15. There are a variety of freshly prepared tasty snacks on the menu. The food is greatly appreciated by those who attend. This activity is a way of being church for families involving fun. Messy Church values are about being Christ-centred, for all ages based on creativity, hospitality and celebration. Messy Church takes place at Abington Avenue URC on the second Friday of every month. We start at 3:30pm – come along after school has finished – for a range of fun activities based on a biblical theme. This is followed by a short period of worship and a short meal served at 5:30pm. There is no charge to attend Messy Church but we request a donation towards the cost of the meal.